Explore the forest to find one of the most sought after of all wild foods, the elusive mushroom. Our expert guide Patrick Hamilton has over 40 years of mushroom hunting experience. We focus on morels, black trumpets, chanterelles and other delicious culinary treats. These classes are held in Marin, Sonoma county, and the Sierras. 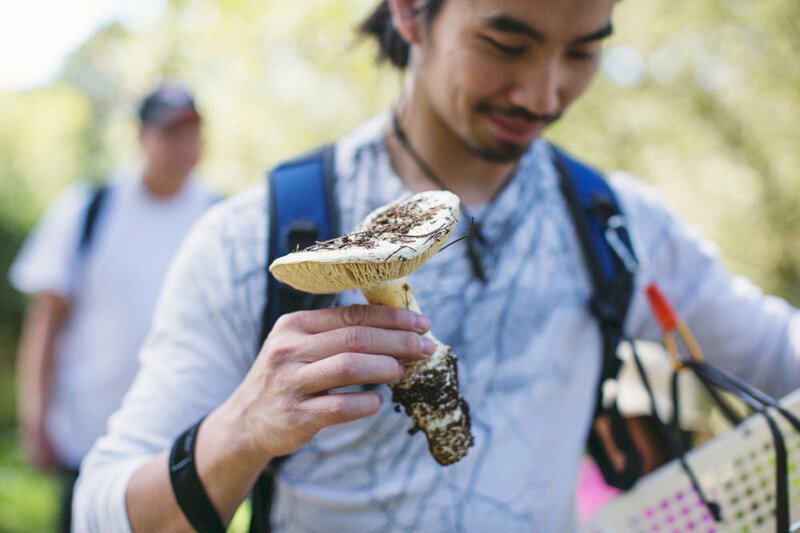 Join Todd Spanier, the “king of mushrooms,” for a foraging adventure on the breathtaking Central Coast. Todd is a long-time forager and mushroom chef with a decade-long history of providing some of the top restaurants in California with the choicest mushrooms. After the forage you’ll get a private cooking demo where Todd will show you what do do with your finds! Always wanted to explore the Oak filled Santa Cruz Mountains? Now's your chance! Come discover and collect delicious wild mushrooms with our amazing guide Maya Elson, while at the same time helping science by documenting what you find. Doing good and eating good all in one. This 2 hour class, led by master forager and author Kevin Feinstein, (a.k.a. Feral Kevin), will cover the most common wild edibles and medicinals in CA, with a focus on what are the most healthy and delicious plants. You'll leave with a great foundation of knowledge for a lifetime of foraging.